TypeXtra was designed to make setting up TypeX and Nesica Systems more straightforward. There are lots of different game sets out in the wild, so setup can be quite a confusing job. This aims to make it a few clicks job. TypeXtra does not come with any "ROMS." That would be illegal. If you own the system you are aiming to emulate, then you can secure a "ROM" image of the game to emulate on your PC. Import other "Game Service" sets - ones that are designed to ensure games boot OK. Some of these have modified game executables, therefore they're not included with this distribution. However, see elsewhere for instructions on obtaining and importing. Import "HD Exe" sets. The original game executables ran at lower resolutions. Some modified executables have been produced to have these games work at higher resolutions (not just stetch to fill your display, but to actually render at higher resolutions). Customise what files launch the game, what file to monitor for the game ending and what controls setting application to use on a game-per-game basis. Runs invisibly from command line - once you have your games set up, send it the short ort long game name and it will boot the game and close itself once the game executable has stopped. This helps with front end setups, where the front end will monitor for the temrination of the launch application (in this case, TypeXtra). Create shortcuts pointing towards the game launch files in either the 'long' or 'short' game format. This can be used to have a front end launch a file directly by executing the shortcut, or, more helpfully, get the correct command line parameter to pass to TypeXtra to launch the game. Hello Stigzler. I've seen you around somewhere else :-) (not Hyperspin). This looks great. The Taito Type X thing has always been something that has completely eluded me. This will give me motivation to try and set it up. Thanks. And i too recognise that avvy from somewhere! Now can TypeXtra my selected Game from Launchbox Start automatically ???? I'll leave the launchbox crew to tell you how to construct the command line in LB, as I don't use it. Thanks a lot for Typextra!! Do you know why the scan find all my Nesica games but none of my Type X? (I found them on a russian cloud). 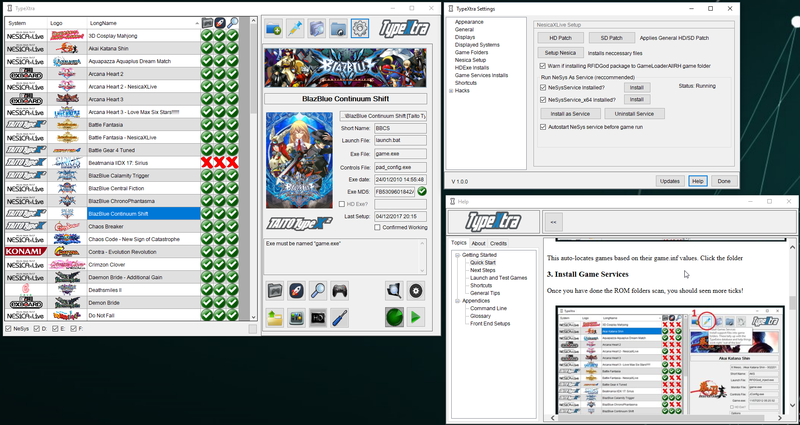 If your set doesn't have the right game.inf you can just point tx to the game folder manually. Via the folder icon beneath the game info.